Europe’s geographical midpoint is located by the St. John Baptist Church near Kremnické Bane. Slovakia boasts the highest number of castles (180) / chateaux (425) per capita in the world. Slovakia produces the most cars per capita in the world, 1.025 million in 2017, or 189 per 1,000 residents. Vehicle production comprises 44 percent of Slovakia’s total industrial output. Slovakia has one of the worst tourism slogans in the world (2nd worst, after Hungary, according to the Telegraph). Trust us, it would be a bad idea to mention it here. Slovakia has the only capital in the world bordering two countries (Bratislava bordering Austria and Hungary). The Slovak language is linguistically closest to all other Slavic languages, lending it a sometime moniker Slavic Esperanto. St. Elizabeth’s Cathedral in Košice is the world’s easternmost cathedral of the western rite. Also in Košice, Slovakia holds Europe’s oldest (and world’s second oldest, after Boston) marathon race. The Ochtinská Aragonite Cave, in eastern Slovakia, is the only aragonite cave in Europe and only one in three in the world; the 34 m / 111.5 ft column in the Krásnohorská Cave is the tallest sinter (dripstone) column in the world. Slovakia has more than 6,000 discovered caves. Slovakia spouts some 1,300 mineral springs; 21 are accessible as spas or recreational areas and a few others are bottled. The world’s first folk architecture reserve was established in Čičmany, in northern Slovakia, in 1977. Slovakia owns the world’s tallest wooden altar, housed in the St. James’s Basilica in Levoča. Slovakia is a landlocked country in the center of Europe. Slovakia borders Poland to the north, Ukraine to the east, Hungary to the south, Austria to the southwest, and the Czech Republic to the west/northwest. The total length of Slovakia’s border is 1,672 km / 1,038.9 mi. The longest border is with Hungary, 679 km / 422 mi, the shortest is with Ukraine, 98 km / 61 mi. Today Ukraine is the only non-EU country bordering Slovakia. 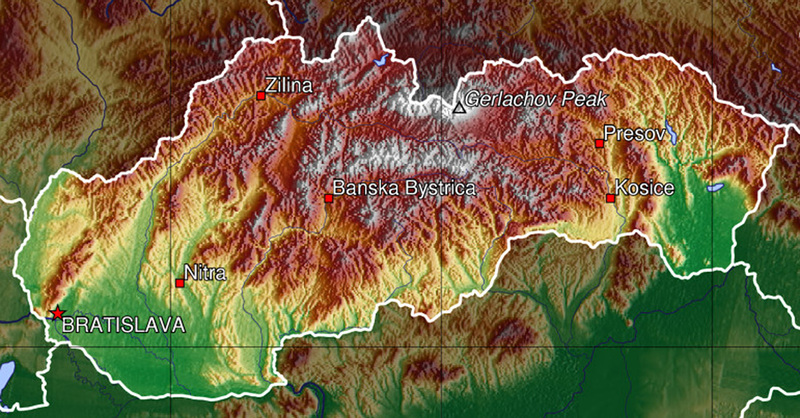 The northernmost point of Slovakia is near the mountain of Beskydok on the Polish border; the easternmost near the mountain of Kremenec near Nová Sedlica where the borders of Poland, Ukraine, and Slovakia meet; the southernmost is near Patince on the Danube; and the westernmost is on the Morava River near Záhorská Ves. Slovakia is 49,037 square kilometers / 18,933 sq mi, ranking in size between Costa Rica and the Dominican Republic. Slovakia’s area is mostly rural: forests cover 41 percent of Slovakia’s area, arable land 31 percent, pastures 17 percent, and cultivated land 3 percent. Built environment (cities / towns / villages / other man-made structures) and rock cover the remaining 8 percent of Slovakia. Slovakia’s terrain is mostly mountainous, with large plains in the southwest (Podunajská / Danubian) and southeast (Východoslovenská / East Slovak). Topographical map of Slovakia. Image CC-BY-SA Captain Blood. The highest mountain is Gerlachovský štít (Gerlach Peak), colloquially known as Gerlach, at 2,655 meters / 8,711 feet; the lowest point is on the Bodrog River at 94 meters / 308 feet above sea level. The country is further divided into 79 counties. The administrative division of Slovakia being relatively new, the borders of districts aren’t defined clearly in Slovaks’ minds. 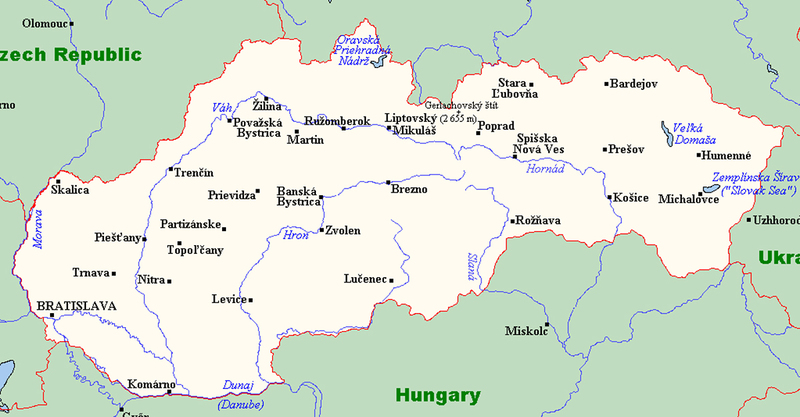 Many Slovaks still use the pre-1993 division into western, central, and eastern Slovakia when referring to locations. There are 140 cities and 2,933 additional municipalities (towns and villages) in Slovakia. The capital of Slovakia is Bratislava, population 429,600 (2017). Slovakia is a country of small towns. Major cities and towns in Slovakia. Image CC-BY-SA Kelisi. Slovakia being a land-locked country in the center of Europe, her climate is moderate continental, with four distinct seasons. Winters are cold and humid; summers are hot and dry. Temperatures typically range between -30 °C / -22 °F (the lowest recorded temperature is -41°C in Vigľaš in 1929) and 35 °C (the highest recorded temperature is 40.3 °C in Hurbanovo in 2007). Southern Slovakia around Hurbanovo and Štúrovo is the warmest area in the country; the coldest is the Tatra Mountains region in the north. Rain. The wettest place in the country is Zbojnícka chata (Highway Robber Chalet) in the High Tatras, getting some 2,130 mm / in of rain annually; the driest place is Galanta with only 483 mm / in of rain. Sun. The sunniest place is Hurbanovo. The least sunny is Orava. Wind. The windiest place is Chopok mountain. The highest recorded wind was at Skalnaté pleso (Boulder Tarn) in the High Tatras, in 1965, with 283 km/hour or 176 mi/hr. The official name of Slovakia is the Slovak Republic. Slovakia is a parliamentary democracy, with a classic three-branch structure. The parliament, National Council of the Slovak Republic, holds constitutional and legislative powers; executive power rests with the President and the Government of the Slovak Republic; and judicial power is entrenched in the Constitutional Court and lower courts. Slovakia’s official symbols are the flag, the seal, and the anthem. Slovakia’s flag consists of three equal horizontal stripes, white, blue, and red, against the first half of which is placed the country’s coat of arms comprising a white double cross standing on the middle of three blue hills against a red background. The three colors historically originated in the Russian flag, which itself was inspired by the French tricolor. The white double cross is said to have been brought to the area of today’s Slovakia by the Byzantine missionaries Cyril and Methodius in the 9th century AD. The blue hills are said to represent the ranges Tatra, Matra (in today’s Hungary), and Fatra. The Slovak coat of arms is based on the sinister of Hungary’s 15th century coat of arms, whose background is green, mountains are red, and the royal crown sits at the base of the cross. The Slovak flag’s dimensions are 2:3. Slovakia has been in existence as a country since January 1, 1993 (see History below). Slovakia is one of the most religious countries in the European Union, with 63% of citizens professing faith in a god (the EU average is 51%). About half of religious Slovaks attend church at least once a week; the other half go to church only on major holidays. As of March 31, 2018, Slovak Republic has 5,442,974 residents. Slovakia’s population density is 111 people per square kilometer (Czech Republic’s is 134, Poland’s is 123, Hungary’s is 105, Austria’s 104, and Ukraine’s 73). Some 230,000 Slovak nationals live outside Slovakia; most Slovaks abroad live in the Czech Republic, Germany, Austria, Great Britain, and Ireland. More than 1 million (2.1 million according to some sources) people around the world claim Slovak ethnicity or ancestry (more than half of them are in the United States). Slovakia is a tiny country, so even the most minor of celebrities garner a lot of national pride. Famous Slovaks, whom you can count on one hand, tend to achieve fame after leaving Slovakia. Štefan Banič – The inventor of the parachute (or not). Born in Neštich, near Bratislava, in 1870, Banič emigrated to the United States, where in 1914 he tested a prototype of his parachute by jumping out of an airplane. He sold the patent to the U.S. military. Adriana Karembeu, née Sklenaříková – Supermodel and former Miss Wonderbra. Born in 1971 in Brezno, she is the model with longest legs, according to the Guinness World Records. Martina Hingis – Tennis champion, former World No. 1 and winner of five Grand Slam singles titles and nine Grand Slam women’s doubles titles. Born in Košice in 1980, she emigrated to Switzerland with her mother in 1987. Andy Warhol – American-born pop artist, whose parents were from Eastern Slovakia. Technically not from Slovakia, as he was born in Pittsburgh, Andy Warhol has a connection to Slovakia as well: his parents were born in Miková and emigrated to the U.S.
Móric Beňovský (1746-1786) – One of the most colourful characters in Slovak history, a nobleman who during his relatively short life managed to be an adventurer, globetrotter, explorer, colonizer, writer, chess player, a French colonel, Polish military commander, and Austrian soldier. Above all, he managed to get himself elected as King of Madagascar (!) by the natives in 1776. His memoirs were a bestseller at the turn of the of 18th and 19th centuries. His life was a source of inspiration for many writers, poets, and composers.